I met Rachel Gold at the conference in Minneapolis in 2012. Again, not a lot of time to sit and chat with her – conferences are so busy – but she made a definite impact. Here was this new author hanging around the Bella Books table, looking a little bit like a kid in a candy store and wearing a t-shirt that said “Being” on the front. It was later that I found out this new author was marketing her new novel! Genius! I sat in on an author reading and Rachel happened to be participating. I listened to her read her excerpt and I was intrigued. Back at the Bella table, I picked up her book, made my purchase, and stored it away in my bag. Later, I would get her autograph. Sure, the blurb said it was a Young Adult title. That was okay…I’m always up for supporting a new author. Back at my hotel room later that evening, I read the summary on the back of the book and, honestly, started to feel a little uneasy. Okay, I knew that this was a book about a transgendered teen. Yeah, I’d heard the reading and I knew that people were talking about it. But there, alone in my room, I really began to think about what it meant. And I really began to think about what I didn’t know. So, yeah, I was a little uneasy. After the conference I read the book and, subsequently, wrote a review (which you can read here). I won’t go into detail – you can read the review. But let me just say that Being Emily is, perhaps, one of the best books I’ve read. Truly. Folks out there must agree with me, too…it’s a finalist for both a Goldie and a Lammy! I’m glad I’m a young adult author because I feel like an awkward teen when I go to conventions. It helped that when I showed up to GCLS I was hugged within the first five minutes of my arrival. That set the tone for the weekend. Last year was my first GCLS and my first novel—all at the same time. I was lucky enough to have the event hosted in my home city of Minneapolis. 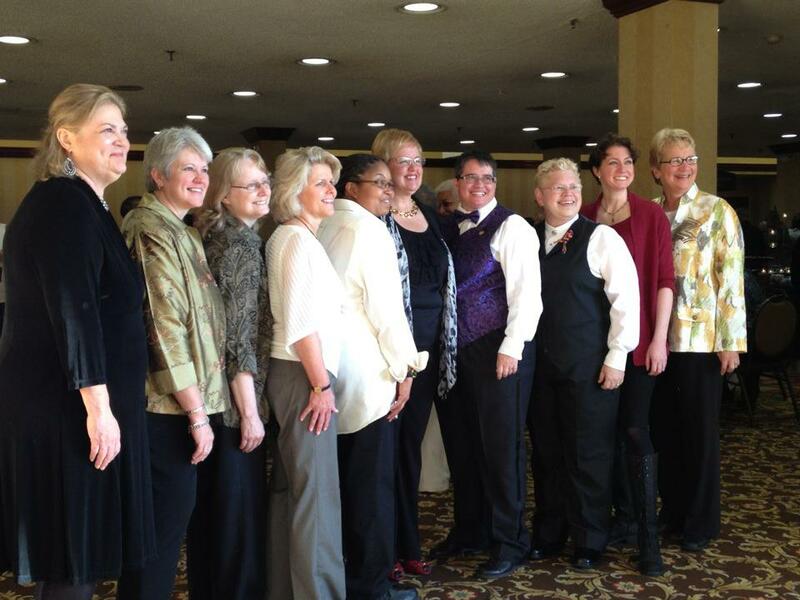 I’d been hanging out in the Sci Fi/Fantasy community and this was my first lesfic convention. 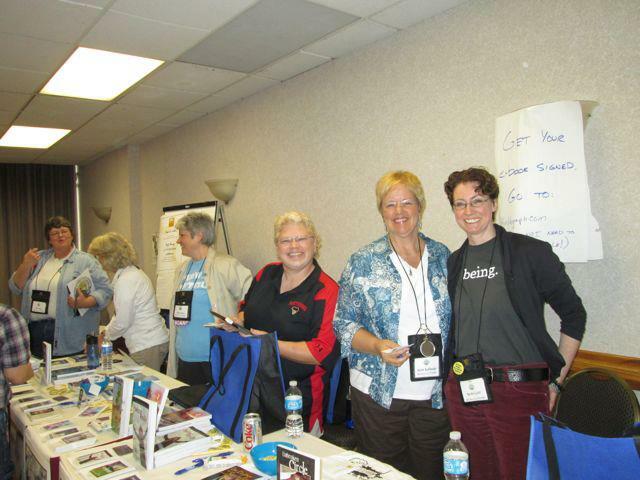 Both SFF convention and lesfic have a few things in common: a profusion of friendly introverts, passionate readers happy to talk about their loves, smart presenters and the opportunity to find new authors and works to enjoy. So what’s the difference? Well with lesfic you get fewer people in costume and you know all the romance readings are going to be the kind you like. Also at GCLS I felt a strong sense of support laced with a heavy dose of in-jokes and an undercurrent of bawdy humor, which is never amiss in a group of women. GCLS is a great conversation to bring a first book: there are a lot of opportunities to chat with other authors and with readers. Last year was a particularly good year for authors and readers of paranormal fiction with Jewell Gomez attending (author of the lesbian classic The Gilda Stories), D. Jordan Redhawk promoting her vampire novels with cool fang swag, and werewolf authors Catherine Lundoff and Allison Moon (not actual werewolves!). Tension creates an energy that draws things to it. It pulls the reader along. Think of the practical realities of creating something extraordinary or magical. Like the vampire living forever. Use those. This creates an internal, organic practical reality. De-leaf the forest so you can see the structure. What’s the reason for each scene? Best ending is when there’s a huge twist when you think it’s all wrapped up and it isn’t. I love that in a mystery because I love being fooled. Yeah, but would you want to cheat on a werewolf? Wait a minute, I thought, didn’t I meet Watty at GCLS? Last I checked she was a real person. Maybe it’s a coincidence or Karin just thought it was a cool name. But the description sounds like her. Nah … Hang on, she’s with a woman named Carleen. Omg, these are the women I met at GCLS last year and they’re in this book. And that is one of the very coolest features of GCLS—that it’s a place where readers can go to a charity auction and come out as part of a novel. Lederhosen. That’s just one quirky subject in Rachel Gold’s background, and not necessarily a subject you’d expect from a woman who spent seven years working as a reporter on LGBT issues for a Twin Cities newspaper. After branching out into publicity and then marketing, Rachel’s life has taken some interesting turns, including winning a national marketing award for using, you guessed it, lederhosen in an ad. Come as your favorite lesbian fictional character? Personally, I think we should do something about the lack of costumes at GCLS. We’ve got a little start on the Karaoke dress up theme, but really, a costume parade featuring characters from books – wouldn’t that be awesome?